As most of us know the weather in south Africa is getting colder and colder by the day, we are in one of my least favourite seasons at the moment. I really not a fan of winter, I just try and survive through it the best way I know how, I am more of a warmer climate kinda girl. I recently changed up my body care essentials to try and bring in the sunshine in my now dull and cold days. Most of this products have a great summery feel to them that will brighten my days till spring. This is what I usually use on a daily basis. The scent is what drew me to the product. It has a light orangey (citrusy) scent that I completely love. They are both great for normal to dry skin, it contains hydra IQ which keeps you moisturised throughout the day. Available at Clicks and Dischem. Another lotion I use regularly ,it's a thick body butter that is great for the cold weather. The best thing about the body butter is the scent, it has a strong fruity scent that is to die for. It's is a peach and shea butter combination so no wonder it smells divine. 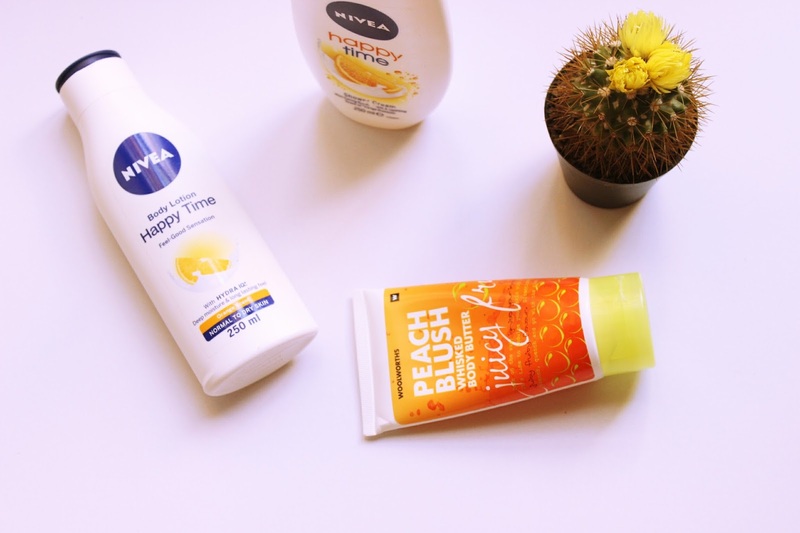 I know I know it's the 3rd nivea product in this post but I can't help it, they are great with skin care. I only started using the oil a few weeks ago but I'm completely in love with it, it makes my skin feel so silky. Keeping up with the summery scents I have been using. They both smell amazing and compliment each other well. Which products are you obsessed with this season?